Are you enthusiastic about breastfeeding and feel it is the ideal, normal way to feed babies? 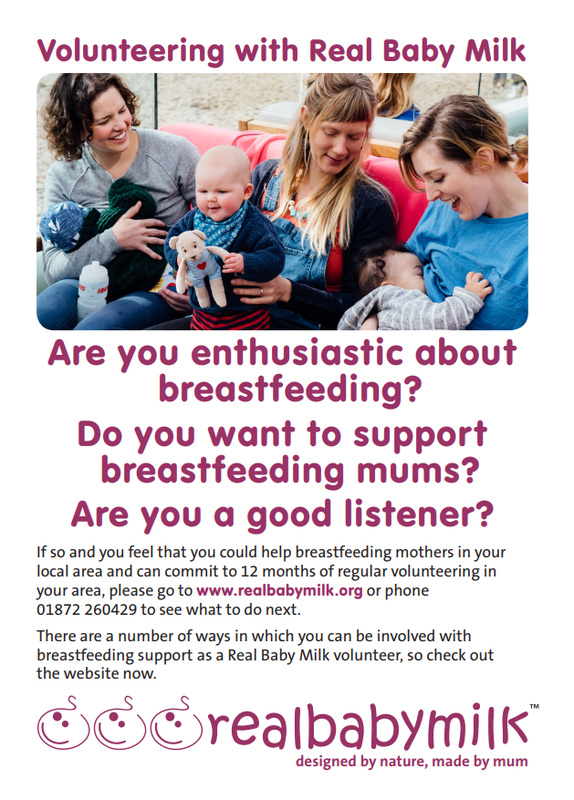 Do you want to support breastfeeding mums? Do you feel that you could help breastfeeding mothers in your local area have a positive breastfeeding experience and to reach their breastfeeding goals? Are you able to commit to 12 months of regular volunteering in your area? If you are a younger mum, or are committed and enthusiastic, but think you might not fit the criteria, please contact us to chat through the training and volunteering options. Meet and Greet Volunteers are enthusiastic about supporting breastfeeding and help peer supporters to run their local breastfeeding group. Breastfeeding Peer Supporters have completed our training course and support mums at groups in the community to reach their breastfeeding goals . Hospital Peer Supporters have completed our hospital training course and support mums at Royal Cornwall Hospital in Truro. Meet and greeters assist with the practical aspects of running a breastfeeding group. They are the friendly faces that welcome mums and offer a listening ear. They work together with peer supporters to create a supportive atmosphere. Some meet and greet volunteers go on to train as peer supporters. In order to volunteer as a Meet and Greeter, you need to complete an Expression of Interest Form to register with Real Baby Milk as a meet and greet volunteer. Please keep in regular contact with us to inform us of your Family Hub application process and to get support with your volunteering. If you have had a positive experience while you breastfed and /or provided breast milk for your child, and are happy to uphold our Aims and Ethos Statement, then our Peer Support course could be for you. Completed their Family Hub/Supporting Organisation application, DBS check and Safeguarding training. There are three courses a year, each in a different location across Cornwall. Each course is led by an qualified trainer. Our courses are very popular and we generally have a long waiting list, so it is important that we chose the right participants. Created by Infant Feeding Coordinators, Helen Shanahan and Stephanie Heard, the course equips volunteers with the skills to provide effective mother-to-mother support within breastfeeding group settings. The course is independently accredited as recommended by The National Institute of Clinical Excellence. This 7 week course is accredited at level 1 or level 2 and leads to an award of 3 credits, with the level 1 course particularly aimed at young mums. Successful completion of this course enables you to become an accredited Peer Support Volunteer and a member of the Real Baby Milk Peer Support Network. Real Baby Milk works with Cornwall Council to support and supervise the peer support volunteer network. Real Baby Milk does this by delivering the specialist training and keeping in regular contact. Cornwall Council’s Family Hubs, and other supporting organisations, also play their part in keeping volunteers safe, trained and supervised by organising safeguarding training, group supervision sessions and processing DBS applications. Because of this partnership, volunteers need to have their applications processed by and remain in touch with both Real Baby Milk and Family Hubs (or other supporting organisations where applicable). Cornwall County Council have funded places for volunteers that can commit to 12 months regular volunteering. Training is funded until March 2019. Have you been a peer supporter for at least 6 months? Can you commit to volunteering at Royal Cornwall Hospital for at least 6 months? Can you spare 2 days a month or more? The Real Baby Milk hospital peer support course could be for you! Get in touch with Anna or check the “Cornwall Peer Supporters” Facebook group for more info.